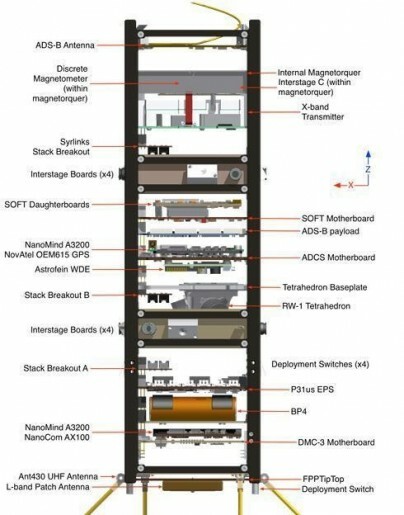 GOMX-3 is a 3U CubeSat flying under the Global Air Traffic Awareness and Optimizing through Spaceborne Surveillance Program initiated by GOMSpace, a company finding its roots in projects developed at Aalborg University in Denmark. The satellite sports a Software Defined Radio Payload for the reception of Automatic Dependent Surveillance-Broadcast (ADS-B) signals sent by commercial aircraft. The monitoring of aircraft over ocean areas is of particular interest to demonstrate a low-cost system for the tracking of aircraft over areas not currently covered by radars. The second satellite communications payload is to be used to receive signals from Geostationary Communications Satellites for an assessment of signal quality in the L-Band range. 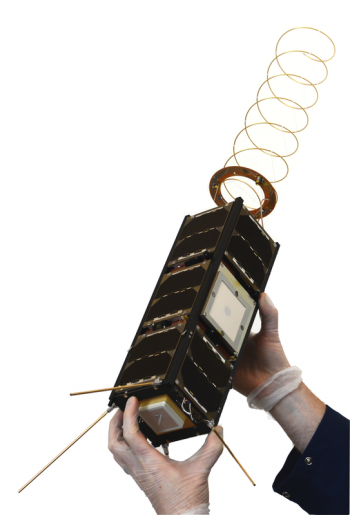 A third party payload flying on the satellite is a miniaturized high data rate X-Band transmitter and patch antenna developed by Syrlinks through funding from the French Space Agency CNES. New satellite platform systems (reaction wheels, fine sun sensors and thermopiles) are also being demonstrated by GOMX-3 to provide a precise attitude determination and control system for accurate pointing of directional communication antennas. The 3U CubeSat features body-mounted triple-junction solar cells employing maximum power point tracking to optimize the performance of the arrays for the given illumination and thermal environment. Power is stored in a BP4 battery module and a P31US Power Module distributes power to the satellite subsystems. Attitude Determination is provided by a series of sun sensors and two magnetometers while attitude actuation is accomplished through the use of miniaturized reaction wheels and magnetic torquers which can be used for momentum dumps from the wheels in a very efficient and accurate small-satellite attitude control system. The GOMX satellite is outfitted with a NanoMind Onboard Computer that handles command and attitude control processing, receives data from all subsystems and payloads, stores it and conditions it for downlink. The primary communications system of the satellite is a half-duplex UHF transceiver operating in the 435-438 MHz range to reach a nominal data rate of 9.6 kbit/s. The satellite makes use of a CubeSat Space Protocol, a network-type protocol implemented by all subsystems across the space link and the ground system, easing the integration and testing of systems as well as simplifying operations since every component is assigned a node with access to command resources available within the network. The main payload of the GOMX-3 satellite is the Software Defined Radio, SDR, that can receive Automatic Dependent Surveillance – Broadcast signals from commercial aircraft. These signals represent periodic transmissions of data by an aircraft’s Mode-S transponder at the 1090MHz frequency, containing the aircraft ID, its position, altitude and intent. These signals are used by air traffic control for areas in which a ground receiving architecture is present, but given the short range of the ADS-B signals, they are not useful over land areas with poor infrastructure and oceanic coverage is very limited. Nevertheless, ADS-B has become a significant part of air traffic control, being used in the same manner as information provided by radars. ADS-B will become mandatory for all aircraft in the near future and there is a strong desire to ultimately phase out the traditional radars and purely rely on ADS-B since the receivers are much easier to maintain. Given the short range (80 Nautical Miles) of ADS-B, there were some doubts as to whether the signals could be received from orbit – a necessity in the overall goal of establishing global ADS-B coverage. The GOMX-1 satellite was the first spacecraft to demonstrate that ADS-B signals could be received in Low Earth Orbit without any problems. GOMSPACE proposes two concepts for the utilization of ADS-B signals by satellites – a small constellation of six LEO CubeSats to collect ADS-B data and send it back to ground stations with a delay, mainly for use in statistical applications, and a constellation of up to 70 satellites capable of relaying ADS-B signals in real time to Geostationary Satellites that then send the data to relevant ground stations for distribution. The ADS-B receiving payload on the GOMX-3 satellite consists of a helical antenna deployed after launch, providing a 10dB gain at the desired 1090MHz frequency. Furthermore, the payload is comprised of an RF front end interfacing with the antenna, a Field Programmable Gate Array used as receiver and a Main Controller handling data acquired by the system and transmitting it for storage in the spacecraft memory. Signal decoding is provided by the FPGA, receiving and digitizing the ADS-B signal blocks that consist of a preamble for time synchronization and 112 bits of data sent at a symbol rate of 1MHz.